PASADENA — Yumi Sato, an award-winning classical pianist from Japan, will have a recital Friday, May 25, at the Assumption of the Blessed Virgin Mary Church in Pasadena. The program begins at 7:30 p.m. and will feature works by Chopin and Lizst. Born in Aichi Prefecture, Sato began playing at the age of four. She won first prize in the 45th Student Music Concours of Japan and the 8th Japan Mozart Music Competition. She has performed as a soloist with various symphony orchestras, such as Capella Cracoviensis (Poland), Philharmonia Hungarica (Germany), Nordwestdeutsche Philharmonie (Germany), Tokyo Symphony Orchestra, Geidai Philharmonia Orchestra of Tokyo, Nagoya Philharmonic Orchestra, and others. 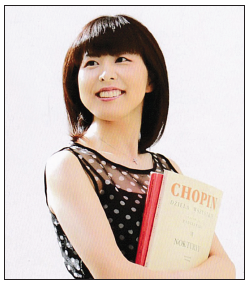 In 2004, she was among the winners of the prestigious Scriabin Piano Competition in Moscow. Admission to the recital is free, and a donation of $10 is suggested. All proceeds will benefit the needy and the homeless through the Society of St. Vincent de Paul. Assumption of the Blessed Virgin Mary Church is located at 2640 E. Orange Grove Blvd. in Pasadena.